On 14 August 1914, a time of great change in the world and Australia, a meeting was convened by Mrs Young, the Mayoress of Camden, to form the first branch of the Red Cross in NSW outside of Sydney (70 years of Red Cross in Camden, 1984). The meeting proved incredibly fruitful, not only for those attending who wished for the Camden Branch to be formed, but for Camden as a whole. The Camden Red Cross (CRC) started the week following the outbreak of World War One, and recently marked 100 years of service to the local community. Red Cross ladies on a street stall in Argyle Street Camden. One has a spinning wheel and looks like there is a mock hut on the kerbside. The first action was, like so many activities during this time, to help the war effort as part of the Home front. Indeed, the CRC was created as a response to the outbreak of war (Stillitano, 2013). Holding stalls, food donations (to aid in London’s food shortage), and cloth making were all undertaken by the CRC. This included raising money for the War Chest Fund, raising £320, a significant amount at the time and the first such activity in Camden (Willis, 2012). 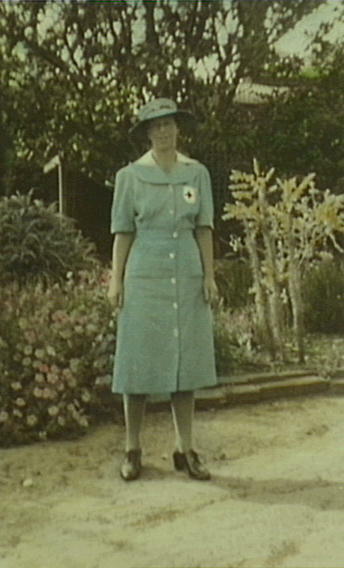 Llewella Davies in Red Cross Volunteer Aid Detachment uniform during World War II. Taken in her garden in Exeter Street, Camden. Although the above images of the Red Cross ladies in WWI and Miss Llewella Davies in WW2 have the iconic image of the CRC, with women in the typical uniforms, the organisation had many other types of members. During WWI it had a men’s division (Wrigley, 2013) as well as a Junior Red Cross Circle (Willis, 2012). Although the district youth helped the CRC as early as 1914, it was only in 1918 that the first circle was established. It reached its highest point in World War II, when seven JRC Circles formed in the area, from Bringelly to Burragorang, Menangle and Narellan. Of these only one, the Camden JRC Circle, would continue after the war and until the end of the 20th century. Here too, boys would join. Their work is still benefiting the community, with activities as diverse as Community Visitor Schemes that reach out to socially isolated older people in the area, visits to nursing homes, and taking blood donations. Numerous commemorations have been produced telling the story of the CRC. In 1984, 70 Years of the Red Cross in Camden was produced. More recently to mark the 100 year anniversary, Dr Ian Willis of the University of Wollongong and the Camden Historical Society wrote Ministering Angels, which focuses in more detail on the services of the Red Cross during and between the two world wars. n.a. (1984). 70 years of Red Cross in Camden 1914-1984: 70 years of dedication. 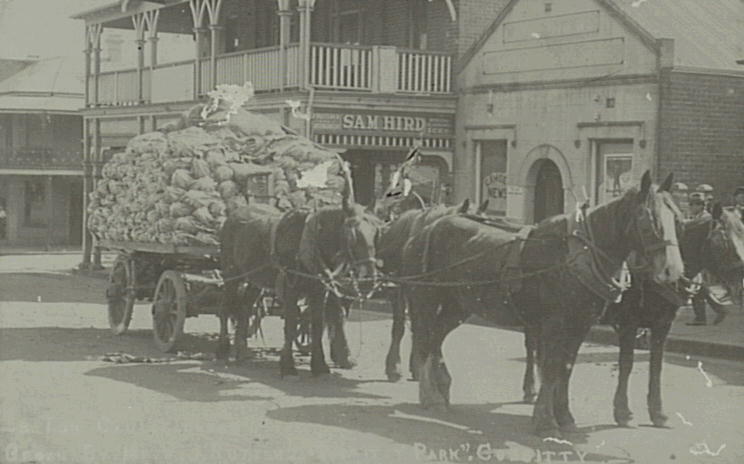 [Camden, N.S.W.] Australian Red Cross Society, Camden Branch. Stillitano, I. (2.10.2013). 100 years of Red Cross. Advertiser. Willis, I. (22.2.2012). Little angels of the Junior Red Cross. Back then. The District Reporter. Willis, I. (31.8.2012). Camden ‘War Chest’ patriotic day 1917. Back then. The District Reporter. Willis, I. (2014) Ministering Angels: The Camden District Red Cross 1914-1945. Camden, N.S.W: Camden Historical Society Inc.
Wrigley, J. (18.10.2013). Camden Red Cross Society- Men’s branch. Back then. The District Reporter. The Great War, although oceans away in Europe, impacted Australia. Not only were there the changes to everyday life and the obvious change that saw many young men enlist and go overseas for the duration of the War, but the social preoccupations of those at home changed as well. As Sue Johnston reported, the absorption of the war meant that all aspects of life, including social, economic, and political, were focused towards the war. 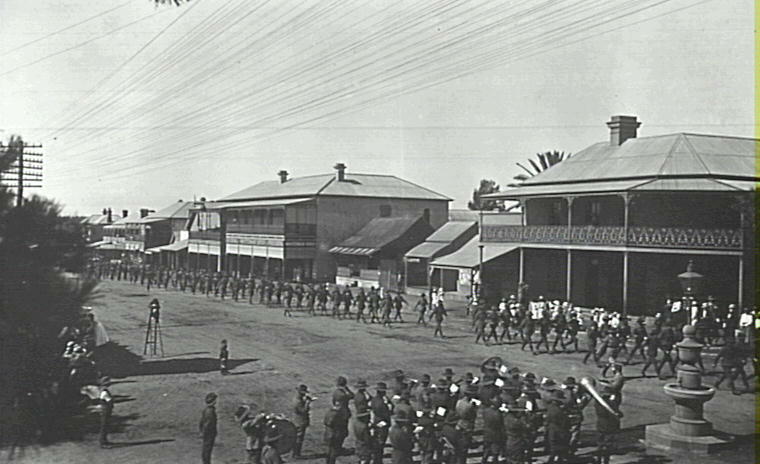 Australian society’s enthusiasm for the war was generated through heavily patriotic schooling developed to encourage a sense of loyalty for Britain and the Empire (McLean, 1995). Johnston confirms that learning history “was mostly the history of Britain and her Empire”, and Ian Willis provides a detailed description of the process of education that resulted in support for the war effort (Willis, 1994). But, despite this, it was at times difficult to encourage support for the war. As a result, many activities to support the war effort revolved around social events. Musical events were organised to raise money for support of the troops. One of these reported in The Camden News reveals that proceeds from a concert at The Oaks School of Arts went to the Patriotic Fund (Willis, 2007). The entertainment was provided by men, women, and school children from the area. These were by no means dreary affairs for a sombre war effort, but were long, celebratory events, starting at 8pm and continuing with dancing until the early hours of the following morning. French troops being entertained in Camden. Held in garden behind CBC Bank (now NAB). Other social events included hosting visits to the area by servicemen. 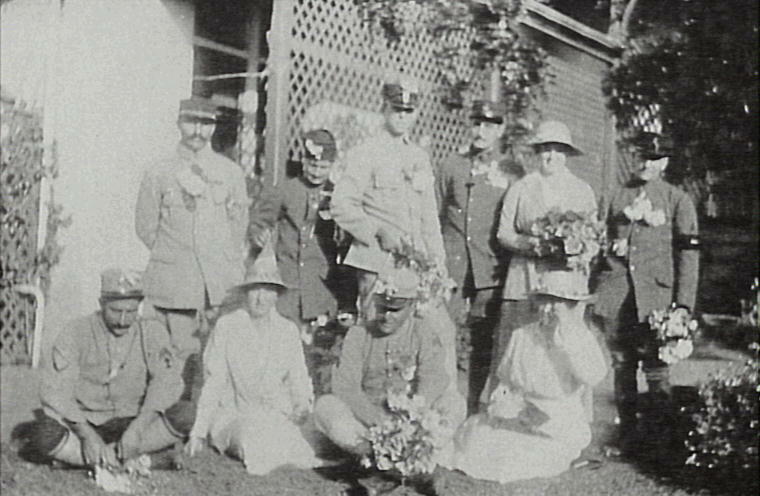 A 1917 visit of French troops to Camden was recorded in a series of photographs, with a lunch held behind what is now the National Bank of Australia. This was also a large social event with many people from the area participating (Willis, 2013). Christmas in particular was very different during the war. As Johnston remembers, the absence of family members who had gone overseas to fight created a “more subdued atmosphere.” As the war continued and casualty lists grew the reason for celebration became less clear, with Christmas too having “a shadow of war weariness” (Johnston, 1984). Possibly a Peace Procession after World War I, 1919. Joy returned with the largest celebration that came on 11 November, 1918, when the armistice was declared. “City streets were jammed with enthusiastic crowds and celebrations continued late into the night” (Johnston, 1984). The war was over, and the celebrations that came were glimpses of the joy and enthusiasm originally expressed towards the prospect of war, with peace processions occurring in Camden in the years following the war. As a way of commemorating the terrible years of the war and the sacrifices of many Australians, Anzac Day celebrations became a tradition following the war. Willis tells us that the celebration of Anzac Day as a national holiday was not whole heartily supported by all individuals, as many felt that it should be a private, sacred observance (1994). When the day was commemorated, McArthur recalls that these were the ‘less pleasant celebrations’ during the decade following the war, with men re-fighting the war, women weeping over a lost relative, and all round little celebration (1981). The Great War was over, but it left great changes in the world, great changes in society and great changes in the people. Johnston, Sue. (1984). Australia will be there : growing up in the First World War. Kenthurst: Kangaroo Press. Maclean, Pam. (1995). War and Australian Society. Australia’s War: 1914-18. St Leonards, N.S.W : Allen & Unwin. McArthur,Kathleen. (1981). Bread and dripping days: an Australian growing up in the ’20’s. Kenthurst: Kangaroo Press. Willis, Ian. (1994). Patriotism and Education in New South Wales. Journal of the Royal Australian Historical Society. June 1994. Vol. 80. Willis, Ian. (2007). Camden’s Rich Musical Heritage. The District Reporter. Willis, Ian. (2013). French Troops welcomed in Camden. The District Reporter. World War One, the Great War, was given its name because it engulfed so many countries in direct conflict. This not only resulted in conflict and death on a scale not yet seen in the modern world, but it also resulted in a great redirecting of resources, with the results being felt in the lives of individuals at home. It was a total war, with everyone from the front lines to the home front being affected. The term home front refers broadly to the domestic, economic, social and political history of the countries involved in World War One. 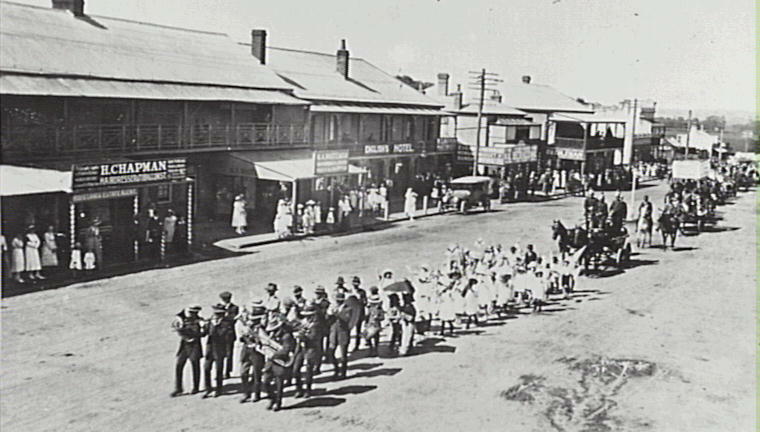 Soldiers marching in a procession along Argyle Street with band playing, 1916. Understanding life during the war is difficult to grasp for many people today because life and Australian society was so different even before the war. The Australian population was only 5 million, with most being of English, Irish, Scottish, or Welsh descent. Sue Johnston records that, “in 1910, with the outbreak of the First World War four years in the future, life for most Australians was slower, more isolated and simpler.” (Johnston, 1984). Although the occasional car could be seen in the street, most transportation in Camden was either with the Pansy tram or with horse drawn carriages. Food was for sustenance with the foodie culture as we know it today unimaginable. Kathleen McArthur tells us that even in the 1920s, “stew was a stew and into it went anything lying around the kitchen or the kitchen garden or the ice-chest.” (McArthur, 1981). Breakfast dishes as simple as porridge required a great deal more diligence than tearing open a bag and adding milk. The oat flakes needing to be soaked overnight before being added to water and boiled in a saucepan the following morning. 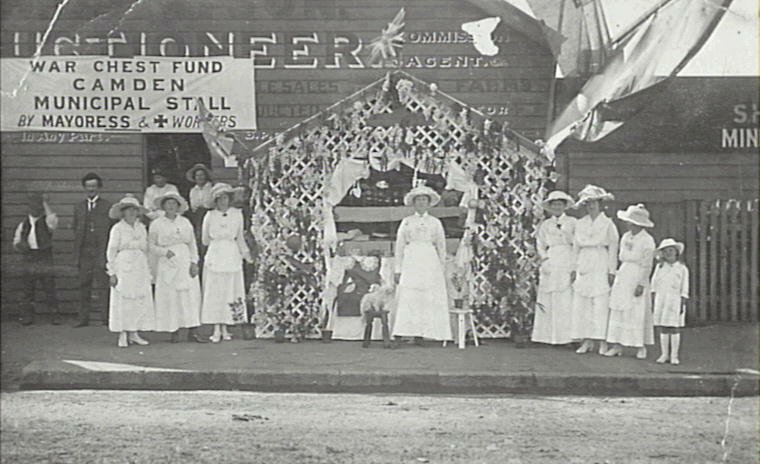 Street stall with group of Camden ladies to raise funds for troops overseas, 1917. Perhaps the most notable change was the combined focus the war gave people on the home front. The focus on the war is perhaps best illustrated by The Camden News, a weekly newspaper that was distributed in Camden, Campbelltown and Wollondilly, which began every issue during the war with a section called “The War Cables”. The segment provided residents with news of movements and offensives that had occurred the previous week. But this was not simply a preoccupation of the press. J0hnston recalls that children were “absorbed by the war: the parades, the songs, the uniforms, the battles, the heroes, the casualties.” (Johnston, 1984). She recalls the enthusiasm with which even school girls such as herself were involved in the war. Eagerly knitting socks for soldiers or insisting that money ordinarily set aside for prizes be sent to the Patriotic Fund. People from Camden held market stalls to raise funds, and soldiers parades down the main streets were a common although infrequent sight. The next instalment will talk about social changes that occurred as a result of the war. n.a. 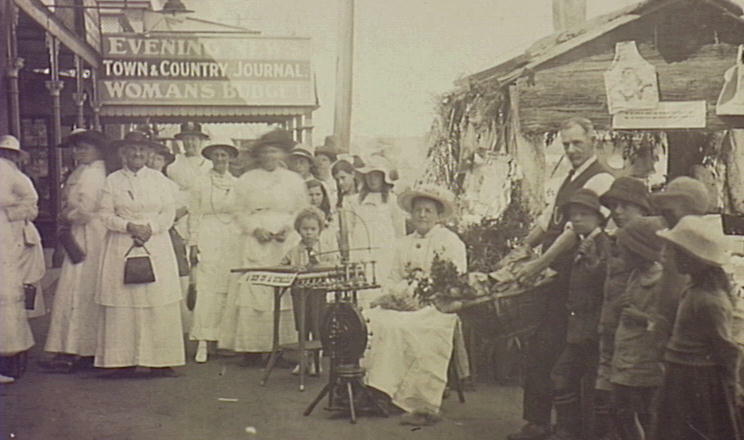 (n.d.) Australia During World War I: The Home Front. Department of Veteran Affairs. The Camden Advertiser 1939 to 1945; Camden News, 1914 to 1918. [Sydney] W&F Pascoe 2012.